The tactics of the world’s first and second largest retailers, Inditex’s Zara and H&M, are pored over globally. But what of Uniqlo’s strategy? All that attention lets the third largest, owned by Fast Retailing, fly relatively under the radar. With a brand value of $7 billion Uniqlo has solid expansion plans, aiming to double the number of stores it has in South East Asia and Oceania to 400 in the next four years. And yet the retailer is a curveball in an industry where success mainly looks like fast fashion – something definitely Uniqlo is not. “We are a digital consumer retail company,” declared Fast Retailing CEO Tadashi Yanai earlier this month. That sentence alone screams strategy and sums up the genius of the Uniqlo model. Look how far down the description Yanai places ‘retail’. Not only do consumers come ahead in the brand’s estimation of what it does, but so too does technology. The statement implies a level of innovation and thoughtfulness that transcends trends and instead pins the brand to functionality, ease and usefulness in its consumers’ lives. With that one sentence Yanai almost redefines apparel. I’d even go as far as to call Uniqlo a technology consumer retail company, if it didn’t sound so clunky. Few other retailers are making as big gains in the science of technical fabrics as Uniqlo, with its monumental HeatTech line, its Airism and its seamless down. Uniqlo nails mass appeal. Its customer comes from any demographic and economic background, across all age ranges. It does that by not pushing any one ‘look’. Rarely are products patterned, beyond a plaid. And very little reference is made to passing fashion trends. Its sizing is getting more inclusive too, running up to men’s 3XL and women’s XXL in much of the offering. Because Uniqlo products are so straight forward, they are also totally open to interpretation. Shopping for basics at Uniqlo does somehow feel edgy in a way that other retail sometimes doesn’t. The lack of options makes your purchasing feel purposeful – the garments you buy are for use not for frivolity. There is something futuristic in having a perfectly edited uniform suited to all environments. 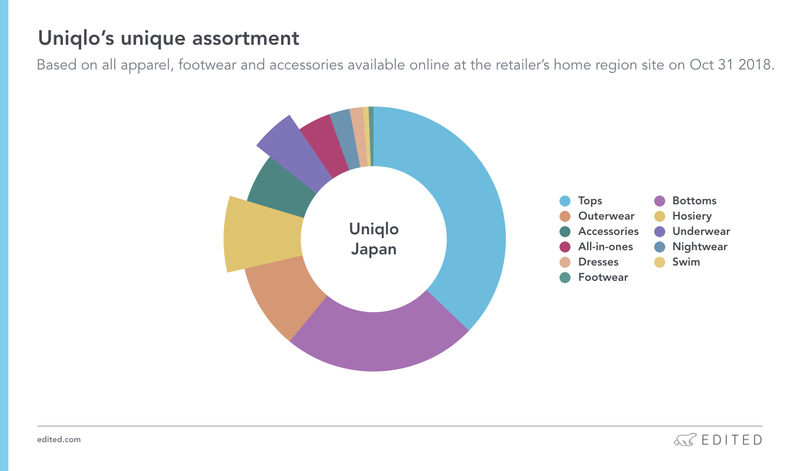 Uniqlo’s price positioning is unique, with a 35% assortment emphasis on the under $10 price bracket. That firmly puts its focus on value – strikingly different to Zara. Just 7% of the assortment is priced over $50 at Uniqlo, compared to 11.5% at fashion-driven Zara. H&M also focuses on value, but places less emphasis on the very lowest price point. Uniqlo is heavily invested in the under $10 part of its offering, with only 7% priced over $50. For one of the world’s largest retailers, Uniqlo’s product assortment isn’t actually that big. Zara and H&M both dwarf Uniqlo. Not only that, but they are growing the size of offering, while Uniqlo has trimmed back slightly from last year. While other retailers race to dominate via assortment size, that’s just not Uniqlo’s game. It has shrunk its assortment a small amount in the last year. It’s more evidence that Uniqlo approaches product design very thoughtfully, as the CEO’s statement at the top of this article implied. New arrivals also speak of a very defined seasonality that you don’t see at fast fashion retailers. Uniqlo has not been lured into year-round drops. Instead, it achieves maximum value with delivery of large orders in consistent manufacturing batches. Uniqlo product focuses on “all-weather” and “year-round” functionality. It’s interesting to see that new product doesn’t follow a fast fashion model however. This makes real use of the way the retailer brings product into stock while absolutely mirroring the way consumers shop, travel and are exposed by the climate today. Uniqlo’s assortment offers just the right amount of uniqueness thanks to two things: its collaboration and its customization. Most recently, Uniqlo has paired with Alexander Wang on a brilliantly well-placed HeatTech collection, which launches next week. But the retailer has a history of tapping industry talent like Christophe Lemaire for LifeWear, Jil Sander, J.W.Anderson, Undercover, Kaws and even Eames. These collaborations, and licence deals with Disney, Keith Haring and Peanuts inject the trend-lite Uniqlo offering with covetable product centred on design, raising the profile of the non-collab core range too. The in-store customization meanwhile adds even value to the product, with seamstresses on hand to take up jeans or ‘made for you’ suiting. This is an extremely elevated ‘value’ shopping experience. The three retailers’ strategies are starkly different, something that’s easy to spot when you see how much emphasis each places on newness. The categories which Uniqlo invests in is incredibly interesting too. There is very little emphasis on footwear, which is unusual for a retailer of this size. Uniqlo gives more attention to hosiery and underwear, which accounts for 13% of its assortment. That outstrips most of the market – at both H&M and Target it’s 6.0%, at Walmart 3.6%, Macy’s 3.0% and Zara just 1.8%. Uniqlo has an unusually high assortment emphasis on hosiery and underwear, at 13% of its offering. This focus is why Uniqlo achieve that under $10 price emphasis and it makes sure it is the destination for core wardrobe items – items which need replacing more often than shirting or denim. Socks are bringing people into Uniqlo stores, where they might also discover a $159.90 seamless down coat. 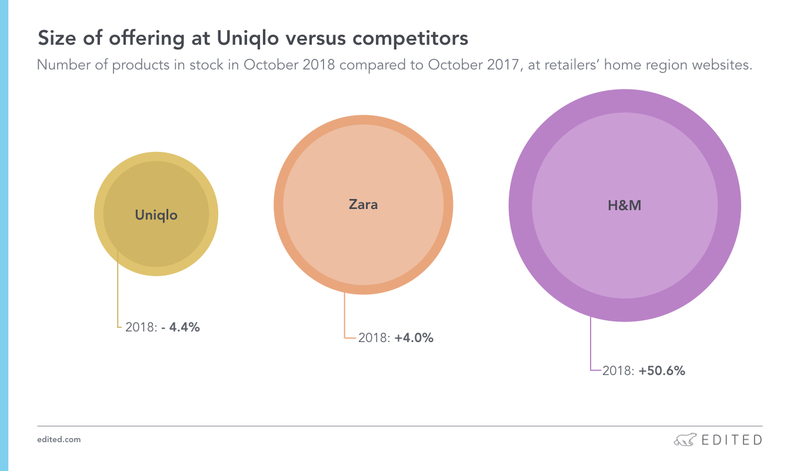 Given how tech-minded Uniqlo is, there’s real potential to grow out its under-stocked swim and nightwear categories, focusing on technical properties. Uniqlo’s passion for sustainability will give this retailer real longevity with the conscious millennial and Gen Z consumers, securing its place in their wardrobes over the next twenty years. You can’t argue that they seem to be well on that path. If you have EDITED access, why not compare the way Uniqlo prices its assortment in 27 different regions. Psst, see if you can spot two regions where the offering comes in noticeably cheaper!